I am absolutely delighted to welcome Stephanie Dray as my guest today on Triclinium. Stephanie is a bestselling, award-winning, two-time RITA award nominated author of historical women’s fiction. Her critically acclaimed series about Cleopatra’s daughter has been translated into eight different languages and won NJRW’s Golden Leaf. 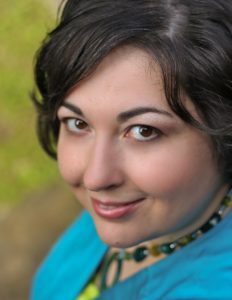 As Stephanie Draven, she’s a national bestselling author of genre fiction and American-set historical women’s fiction. She is a frequent panelist and presenter at national writing conventions. Before she became a novelist, she was a lawyer, a game designer, and a teacher. Now she uses the stories of women in history to inspire the young women of today. I blame my grandmother. She used to cart my cousins and me around in the back of her Lime Green Ford Fairlane while she shopped garage sales, and it was my job to keep the other kids in the car. The only way I could think to do it was by telling them outrageous stories to keep them in my thrall. It was good practice for a writing career! As for which authors influenced me, I’d have to say Margaret George, because when I finished reading her MEMOIRS OF CLEOPATRA I had to know more about her daughter, Cleopatra Selene, and thus my career was born. My latest book, AMERICA’S FIRST DAUGHTER is a family saga about the loving but sometimes dysfunctional relationship between Thomas Jefferson, the third president of the US, and his devoted daughter, Martha “Patsy” Jefferson Randolph. My co-author and I were inspired to write about this because so much has been done on Jefferson the founding father. We wanted to explore what he was like as a father. And I think the theme that grew out of it all was that this country was enormously hard to build. It took a great deal of sacrifice and pain from people who chose to sacrifice and those who were forced to it. I’m in love with the ancient world for all the same reason the Founding Fathers were in love with it. So it’s a natural thing for me to switch back and forth between, say, ancient Rome and the early American Republic. I was a Government major in college, and went on to law school, and so the stories about how people choose to govern themselves are meaningful and interesting to me. For the Jefferson novel we were both extraordinarily lucky and unlucky. The lucky part is that the National Archives has digitized more than 17k letters of Thomas Jefferson’s. That’s also the unlucky part. We had such a wealth of information to draw from, but it also limits you when there is a historical record of what a man was doing almost every day of his adult life. As for how long it took us, we like to joke that it took five years, three agents, eighteen thousand letters and a road trip. And that’s really not far off the mark. I’d love to say that I skip it and move on so as not to interrupt my writing flow, but the truth is that everything comes to a screeching halt, I start searching and wracking my brain for exactly the right phrase. And next thing you know half my work day is gone. When I’m writing about the founding fathers I’m very reluctant to put words in their mouths. That means going through their letters to find things that they actually said that would substitute for dialogue. It’s crazy time-consuming. But very rewarding. And a little bit nutty. I do use scrivener. I very rarely write anything in longhand. Only when I wake up in the middle of the night with an idea and I have to scribble it down really fast. I guess I have to say the Ara Pacis from the Augustan age. It inspired the approach of my trilogy about Cleopatra Selene. There is a so-called Tellus panel of a mysterious goddess. One that Augustus felt obliged to honor. 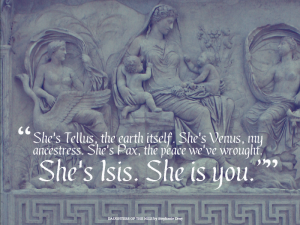 From that panel, I spun out a story about who I believe the identity of that goddess to be. Know what you’re getting into! The writing business is unlike any other business out there. My next book will also be co-authored with my good friend and colleague Laura Kamoie. It will be about Life Eliza Schuyler Hamilton the wife of our first secretary of treasury. And I’m so excited about it! The musical that is so popular right now is of course fantastic. But it leaves so many questions that Laura and I are going to be able to answer. It is in Paris, at the glittering court and among the first tumultuous days of revolution, that fifteen- year-old Patsy learns about her father’s troubling liaison with Sally Hemings, a slave girl her own age. Meanwhile, Patsy has fallen in love—with her father’s protégé William Short, a staunch abolitionist and ambitious diplomat. Torn between love, principles, and the bonds of family, Patsy questions whether she can choose a life as William’s wife and still be a devoted daughter. Her choice will follow her in the years to come, to Virginia farmland, Monticello, and even the White House. And as scandal, tragedy, and poverty threaten her family, Patsy must decide how much she will sacrifice to protect her father’s reputation, in the process defining not just his political legacy, but that of the nation he founded. Thanks so much for sharing your sources of inspiration, Stephanie. What a challenge to research such a prodigious number of sources! Stephanie would love you to connect with her on Facebook and Twitter. You can buy all her books via her website. And as a special treat, why not join her Historical Book of the Month Club by subscribing to her newsletter – lots of goodies to win and history to learn! Thank you for a fascinating in-depth interview, Elisabeth. I’ll certainly read America’s first Daughter. Thanks for this interview. 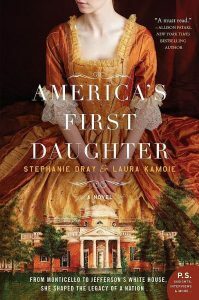 America’s First Daughter is a novel I will look out for.